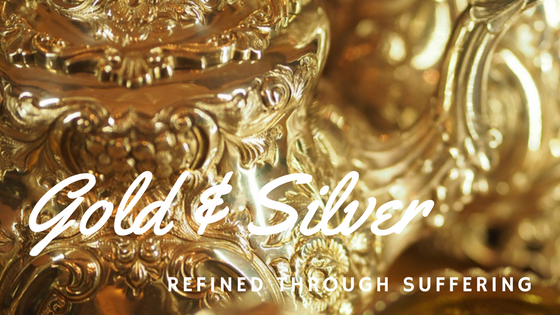 Gold and silver are among the rarest and most precious metals; both need a refining process to remove impurities, thereby increasing their value. It is through suffering, in the heat and pressure of life, that we are refined for God’s glory. Every trial, assault, persecution or difficulty God uses to purify, refine and even promote us to excellence. God does not cause the suffering we face. He is not the evil one, our adversary! He does, however, use “the furnace of affliction” as an instrument to remove impurities from our lives. A dove? The symbol we typically relate to peace? The Lord’s army, refined, purified, sheathed, and shining, going forth with gentle strength fulfilling His command; it is an army equipped and ready to do great exploits for his kingdom. In this psalm, the army returns sharing the plunder with those who stayed safely home. Refined ones don’t hoard the spoils of victory. With purity of heart, people are treasured above accolades and wealth. “Dove” people gently and sincerely place genuine value in everyone. David speaks from his own experience. After defeating the Amalekites, David and his fighting men returned to camp, where those too weary to fight had watched over the supplies. The account tells us the “evil men and troublemakers among David’s followers” (vs 22) were not willing to share the plunder. who went down to the battle. David had allowed the furnace of suffering to refine him into a golden dove of gentle protection to all. Many people do not consider themselves “leaders”. Truthfully, we all lead. We are continually leading and teaching through our example. These words pierce my heart like a sharp well-aimed arrow. The truth that my choices may cause someone to stumble is humbling. The more God promotes and increases our sphere of influence, the greater our capacity to cause offense leading people away from, rather than toward, Christ. until we re-present the Father’s heart. It is in suffering that we are formed into His image of love, a love that causes us to lead others well, without disgrace or shame. Hidden impurities in our lives will tarnish the “positions of voice” God elevates us to. The higher the place of honour we are given, the brighter the light shines on us. That exposure will automatically reveal scars, blemishes, blunders and impure motivations. I am thankful for God’s loving care in allowing suffering to first eliminate what needs removing before elevating us. you who have done such wonderful things. The intricate working of The Master Craftsman, every indent and swirl, does not blemish us. He is enhancing and bringing out greater beauty and increasing our worth. Though the process is painful, the result is impeccable perfection. We may cry, “Enough, God! Stop the pain!” He alone knows the end from the beginning and is making a masterpiece of our lives. With God suffering always has purpose! When suffering ends, honour comes! In fact, God’s word says greater honour! With greater purity comes greater beauty that brings Him greater glory. for my own sake, I do this. The ugliest dross in my life is the “self” portions, that tarnish His reflection, contaminate His goodness, pollute His love and hide His glory. God knows that only through the intense fires of suffering will His glory be fully revealed in and through me. No one else deserves glory; God alone is worthy of glory, honour and praise! and light in darkness of night. Sign up to receive blogs automatically here! Thank you, MaryAnn. I love the image of warrior doves. You have encouraged me today. Only God would think of such a combination of attributes for His mighty ones!